we have an extremely tiny bedroom, so no room for bedside tables. our alarm has been across the room at our feet for the last month – it’s no fun hitting snooze when you have to get out of bed. 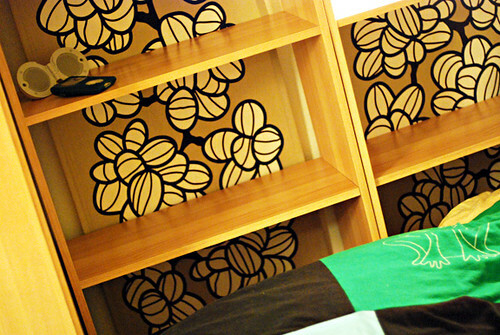 so this shelf-headboard gives us the reachable shelf space we need, and it puts some color into the blah little room. perfect! if you want to copy – we got two of the cheap (but nice and solid) flarke bookshelves, and enough ikea fabric to reach from top to bottom on both (i think 4 yards total). we wanted to use the fabric that came hemmed, so it doesn’t reach to the sides, but that’s convenient for power chords, and i think it looks fine still. 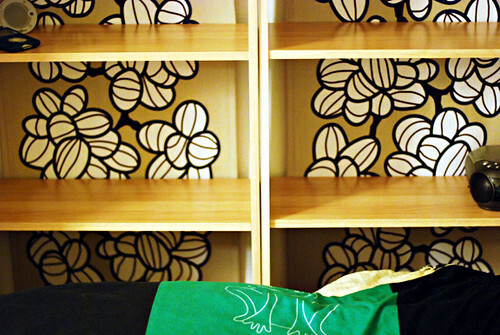 when you build the shelves, instead of nailing the white backing on, nail on the fabric, so easy! 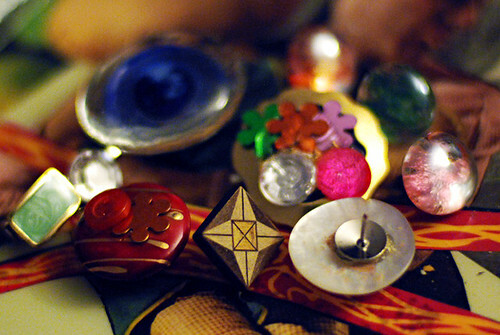 i had a super fun handmade-overload day today – hung out with diane and susan all over east portland! we ate at tiny’s on mlk (yum! ), then hit union rose, frock, redux, and trillium artisans. SO much brilliant stuff being made in portland!! it’s really inspirational seeing all that amazing work. i think frock was my favorite, but i really loved all the stores in different ways. 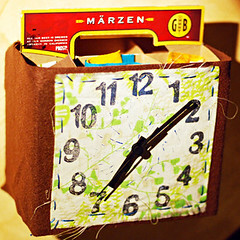 i especially love how much of the work is being made with recycled materials, woo! combining my two loves: photography and crafting! i’ve been meaning to post this for awhile but have been so busy, so i’ll take this lazy day off opportunity to catch up. back in august, immediately before the move (like, on the way from la to portland) i shot a wedding. i don’t shoot weddings, but a college friend asked me if i would, and i figured sure, why not? it went really well, i’m super happy with how the shots came out, but i don’t think i’ll ever be shooting another wedding. well, unless it’s for a really close friend or a family member, then i would. 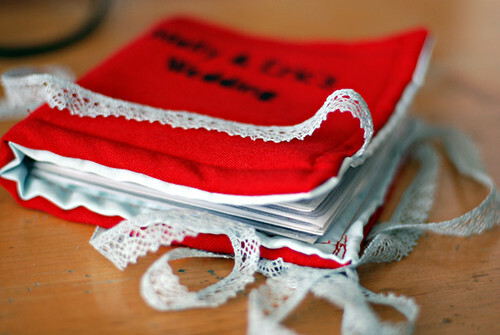 it was just so much work – i finally got everything done and mailed off to the bride a couple weeks ago, and the wedding was august 12th. that was some serious editing. 6 gigs of memory full of photos. yeah. anyway, so the point of this post is to show you the bit of craftiness i incorporated into the job. i am always using my photography to show my craft creations, so i wanted to bring some craft element to my photography, fun stuff! 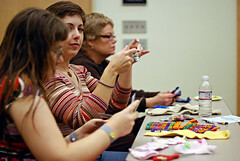 last night i did a zine reading/craft project at the multnomah county library in hollywood, with heather mann of croq. i was so freaking nervous about the whole public speaking thing, but it went pretty well. 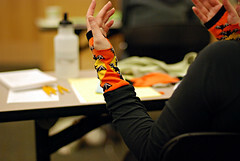 i read a couple pieces of the zine, then i had everyone make their own sock ninja mitts, which worked out really well. 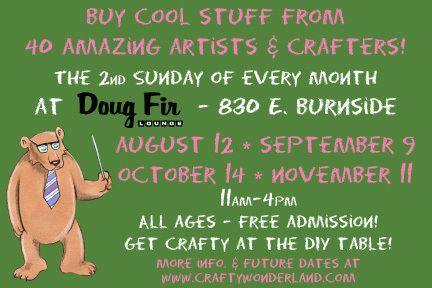 there was a good turnout, including craft superstars susan and diane; and i met a cool crafty girl who just moved up here after graduating from uc san diego, my school! pete took a photo for my blog of diane taking a photo for her blog! blog points!?! heather had us do a craft too – she gave us all baggies full of all kinds of little stuff and some tacks, magnets, and pins, so we could glue things to things! i made all these! then we did a q + a about our zines, crafting, etc. thanks to everyone who came! and thanks to pete for all the great photos! i am so relieved to have a little time with no major deadlines or events in front of me for awhile…. sigh…..
yay i just finished my store update with all the patches and clock kits added! 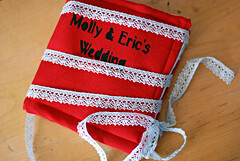 whole new category now for diy kits where i linked to all my blog tutorials/patterns for more diy fun! i’ll be adding more to that page as i write more tutorials, and i have plans for more kits. 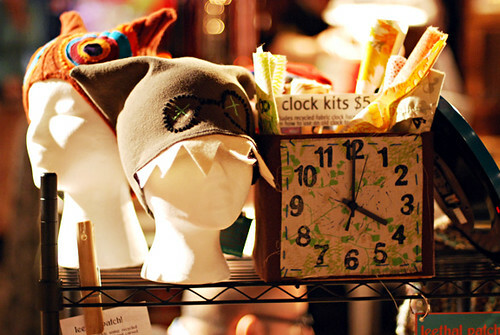 didn’t take many photos at crafty wonderland, but that was some of my display. it was a super tight fit in our little 4×4 square, but it worked. i got a pretty good response on everything. it’s hard figuring out what i should focus on making more of based on people’s responses. 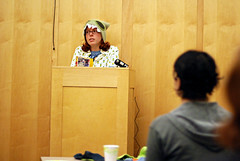 the one item that got the most love was my monster hat with the teeth and the yellow button eyes, but it didn’t sell – i didn’t sell one single hat, which is weird, they usually do pretty well. but the mitts all went (except for that orange pair, which i am always tempted to keep as my own because i absolutely love them and they never sell, so sad). i sold a number of items that have been around for years and i thought would never get picked up, so that was really happy. yeah overall it went really really well, fun crowd, great time! ok i do have plans to write about crafty wonderland (it went well!!) 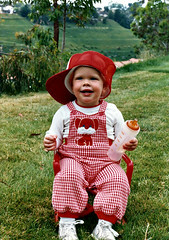 and i had been planning to write something for blog action day, which happened yesterday, but there was no time dammit! so it would be stupid of me not to write what i was going to write just because i missed the day, so that will come soon. and there is more on my blogging plate, but just so little time, if only i could blog at work!! life would just be so much better… for now, i am already running late for that dreaded day job, so off i go. edit: update post here with different versions and link to free pattern pdf download, which is also on ravelry. 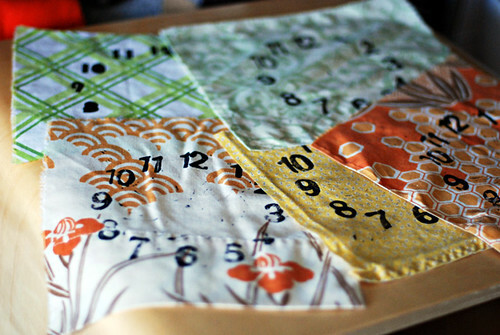 ok i have a bit of free time, woo!, so i’m gonna write this pattern while watching mary tyler moore on dvd, yeah! first i will give you some background to show how i came to the design, which will hopefully encourage some people out there to try mixing different ideas from different patterns to come up with your own designs! 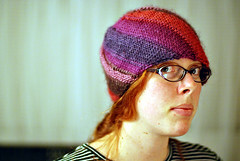 the first one, spiral knit cap by patti mcguire on head huggers, i knit a couple years ago, my first hat not knit in the round. 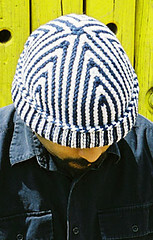 it taught me the spiral concept which i’ve used in several hats since then. the basic idea is increasing on one edge and decreasing on the other. 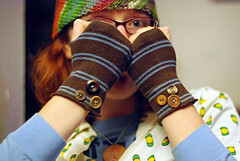 i made the pattern without the bottom cuff or pompom, super simple. so for the orange hat, i did the spiral, but with an extra added increase and decrease to make the wave. the second is tychus by brooke t. higgins on knitty, which i knit about a year and a half ago; it taught me short rows, which is a very useful technique to know. basically, you just don’t knit to the end of the row – you stop before the end and turn. in the tychus pattern that’s all there is to it, but usually you need to wrap the next stitch so it’s all smooth with no holes. i’ll explain that in a minute. this is a really good pattern to first learn short rows, if the concept is new to you. 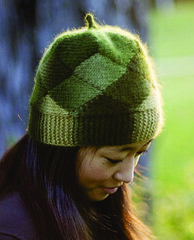 and the third is short-row hat by veronik avery on interweave knits (2015 update: the link works now), which i just made a few months ago. 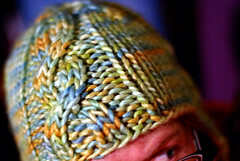 this is a pretty intense hat to knit, took me awhile, i wouldn’t recommend it to a brand new knitter, but i absolutely love the finished product! 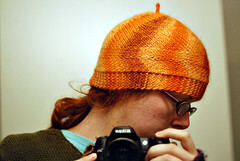 i copied the garter stitch brim and i-cord topper for my orange hat. 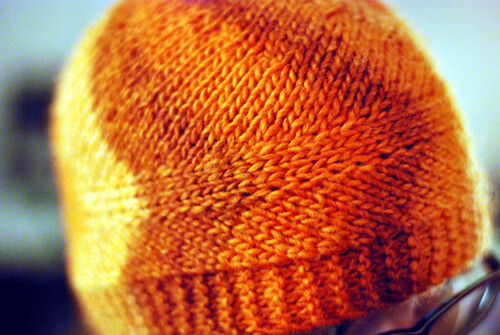 this pattern also taught me the invisible/provisional cast on, which would be very useful for the orange hat, although i’m usually too lazy to do it when i start my hats, so i end up picking up stitches at the end for a 3-needle bind-off instead. so for this pattern, you’ll need to wrap and turn for the short rows, which looks like “w+t” in the pattern. this means you bring your yarn to the front of your work between your needles, slip the next stitch over to your right needle, bring the yarn back around the stitch to the back of your work, slip the stitch back to the left needle, and turn the work to begin knitting in the other direction. it sounds super complicated, but you get the hang of it real quick so it’s no big deal. you can see some photos here if you need to see it being done. 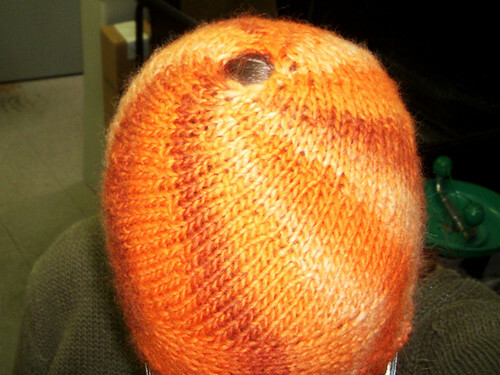 you can choose how to begin and end the hat – i cast-on normally and then when it came time to join the edges i picked up stitches on the cast-on edge and closed it up using the 3-needle bind-off method. it would make a lot of sense to cast-on using the invisible/provisional cast-on, then you don’t have to pick up the stitches at the end. if you would rather not do any of these, you could be cast-on and -off normally, then sew up the seam however you choose. 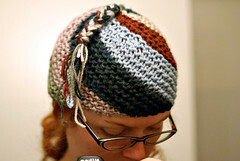 i used the make 1 increase, but you can use the knit into back method instead if you prefer. i’m writing the pattern with a stitch marker helping you keep track of the short rows, but you can choose not to use it. 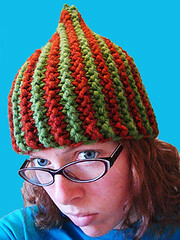 finished hat measures about 10 inches across bottom when laid flat, unstretched. it fits my 22inch head perfectly. start with the wrong side so that the tail is on the top, so purl (p) until last 6 stitches (sts), knit (k) 6.
now you start the pattern, which is made up of wedges formed by short rows. k 6 sts, knit 2 together (k2tog), k 4 sts, increase (inc) 1, k 3 sts, inc 1, k to last 5 before end, k2tog, w+t. p 5 sts, place marker, p to last 6 sts, k 6 sts. k 6 sts, k2tog, k 4 sts, inc 1, k 3 sts, inc 1, k to marker, remove marker, k2tog, w+t. repeat the last 2 rows three times, so you have 3 sts after inc before marker. p to last 6 sts, k 6 sts (don’t place marker anywhere). k 6 sts, k2tog, k 4 sts, inc 1, k 3 sts, inc 1, k to last 2 before end, k2tog. slip 1 st, p to last 6 sts, k 6 sts. 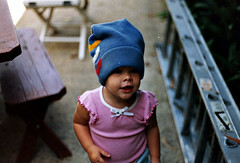 repeat the wedge 8 times, or until hat measures the circumference of your head when stretched. if you used the provisional cast-on, now you can slip those stitches onto your other needle and 3-needle bind-off up to the top. if you cast-on normally and want to pick up stitches for a 3-needle bind-off, you need to skip that last purl row of the last wedge, and instead bring the cast-on edge around and pick up 35 stitches down to the bottom. (before picking up, you should slip your working stitches onto the other needle, so the needle is facing the opposite direction.) now grab a 3rd needle and bind-off up to the top. if you want to sew up your hat instead, on that last purl row of the last wedge you can bind-off, then use the tail to sew it up. leave the tail super long so that you can use it to pick up stitches and finish the top. you can choose to cover it with a pompom or something, whatever you want, but i’ll tell you how i did it. use double pointed needles (dpn’s) a little smaller (i used size 10s) to pick up sts around the hole (i picked up 12 sts, but you don’t need to be precise here). k around once, then k2tog, k1, around twice, then k2tog until you have 3 left total. put all 3 on one dpn and knit an i-cord as long as you want it. break yarn and use a tapestry needle to pull the tail through the center. weave in ends and you’re done! yeah! i would love to hear any feedback, so i can make changes if things are hard to understand. 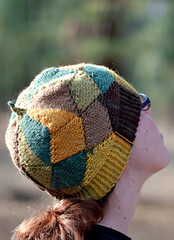 and i would really love to see people’s finished hats!! 2015 update: I left the above post as it was, when I wrote it waaaay back when I first started dabbling in knit design, but if I were rewriting the pattern now, I’d definitely tell you to use a provisional cast-on (here’s a tutorial) – I’d never recommend that picking up stitches for a 3-needle bind-off idea (what was I thinking?!) – and I’d be more clear about the short rows (here are a couple of methods you could use for wrapping), and there are other issues… but it’s mostly an okay, usable pattern, so I’m leaving it there. Just don’t judge my current pattern-writing quality on this one! crafty stress is the good kind of stress, right? 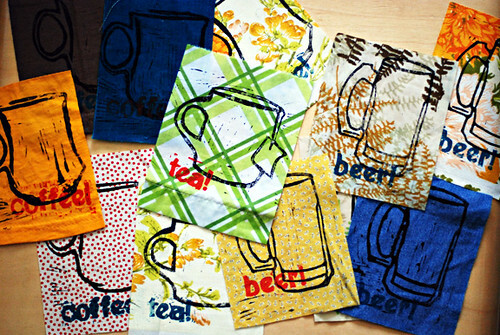 all printed on assorted recycled fabrics. some with top-stitching, some without. i made 37 of each (111 total) – 80 are going to the sampler, 5 complete sets to media samplers, and 16 leftover for wonderland. 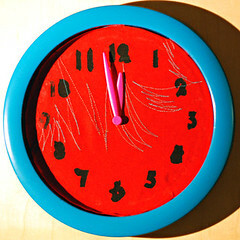 and, my newest creation, diy clock kits! i made 37 clock faces – 20 samples, 5 media samples (with top-stitching), and the rest for wonderland. whatever is left sunday night will go into my leethal store as soon as possible. my first portland craft show! if you are in the area, be sure to stop by! it’ll be awesome! yeah! ! 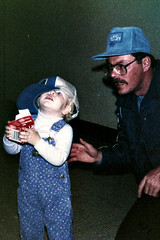 i’ve always loved hats. always. 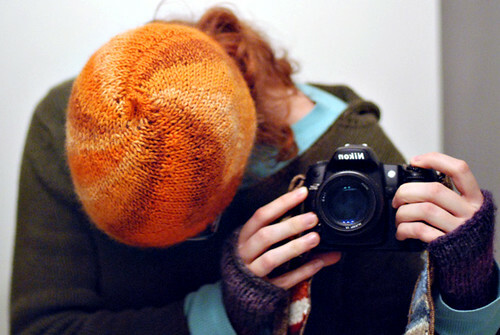 so anyway, when i first started knitting and crocheting, which was about 5 years ago, i was way into the idea of making hats. 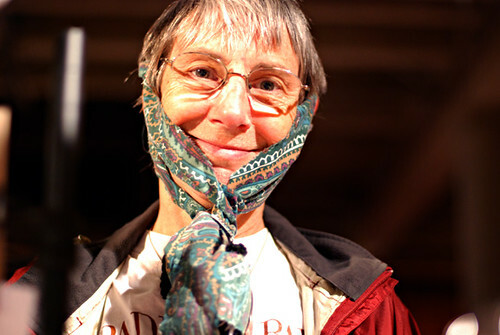 and once i mastered the garter stitch scarf, that was pretty much all i made. i’ve made 80+ since then, and never get bored with them. i’m writing about this today because over the last couple weeks i’ve been going through one of my hat phases that happens every once in awhile during which i just can’t stop making them – i’ve made 5 in the last week and a half! all these design ideas go through my head and i have to try them out; i make one which leads to new ideas, then i have to make that one. so i’ve been thinking about writing up some patterns for a couple of these and posting them here. i am most proud of the orange one – the shaping and everything is really perfect, so much better than i’d expected it to be based on my past results of my trial and error methods of design. and it’s pretty simple really, so i think that will be my first pattern, later this week probably. 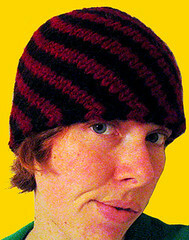 my main purpose of putting up these patterns will be to teach beginning knitters, or knitters with little-to-no hat experience, some understanding of techniques i’ve learned so that you too can make up your own designs. i have been making up my own designs since the beginning – i didn’t even learn how to read a pattern until about a year ago – so i want to encourage knitters to venture outside of the pattern world a bit. by posting patterns… hmmm… doesn’t seem right. 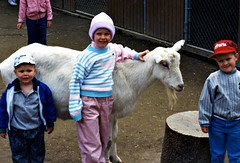 i guess the thing is, before i started reading/knitting from patterns, i was really limited in my techniques. patterns teach me so many new things that i come to understand enough to use in my own designs. so, i’ll be writing my patterns with this in mind, trying to help you really know what’s going on instead of just a series of letters and numbers that you follow to reach the end result. sound good? so, stay tuned for that! 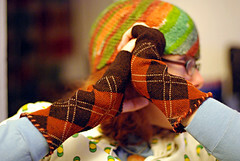 oh, if you are on ravelry, you can see all (well, most) of my projects here. 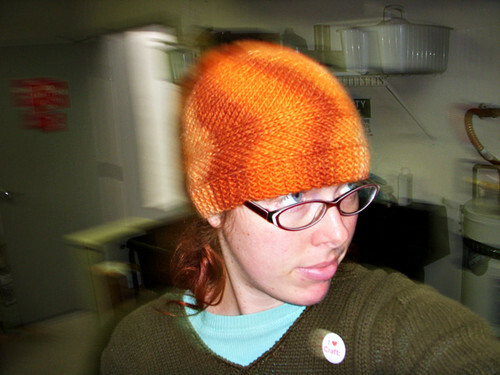 if not, my flickr has knit projects spread around a hats set, assorted knit stuff set, old stuff i made set (yeah i need to organize my flickr, i know). my very own creative space! my studio is ready for sharing! i’m so happy with it, i just want to spend all day every day in here crafting! it’s not completely done yet, the walls are still pretty bare, all the space above the shelving and cork board… i’ll figure out something interesting to do with it. and i have plans for curtains, they are gonna rock sooo hard! a lot of the photos look kinda messy because there is so much going on, but it’s all very organized and everything is up on a shelf or in a bin or basket so there is no actual clutter at all. 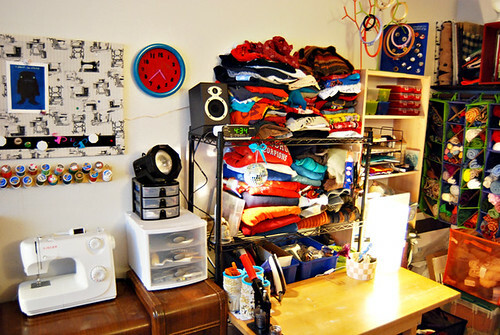 which is amazing for me, seriously, i am the master of clutter. i’m working hard to keep it all organized and putting things back after using them, it’s tough but it’s worth it! so here we go…. 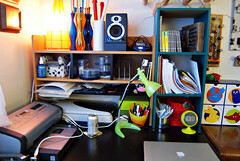 the desk is where my laptop goes, with my printer and scanner, and i can hook it up to my nice speakers (thanks pete!). for music, i also have my rad old record player, and there’s a radio over on the other side for npr listenin’. noteworthy on the desk: i love my knitting needles in the orange+blue ikea vases; that awesome wine thing looks neato and i plan to use it for yarn display at craft shows when i start selling hand dyed/spun skeins; i got that green spherical clock at a fundraising sale at in other words for $4 – when you smack the top, a computer voice tells you the time! thift store finds: the long desktop shelf is from the bins (milwaukie branch), the turquoise unit also from the bins, the wine thing from value village, the framed craft prints (sewing machine, iron+scissors, spinning wheel) on the corner wall from a shop in orange, ca. one other fun thing: on the top turquoise shelf you can see a chunk of wood – that’s a weaving loom i think my dad made for me when i was in maybe 3rd grade-ish, and the weaving on there is from when i was a kid and was always starting projects and never finishing them. 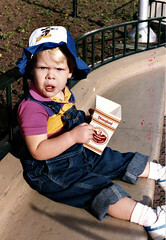 so glad i’ve grown past that! ok and now the sewing table. nothing much on it, but what’s above it is pretty cool. 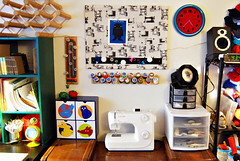 i made the cork board with that fabric i found at knittn kitten, then i stuck a magnet strip from ikea across the bottom. i need to find a frame for that print by chloe goodwin (from crafty wonderland!) then i might do another magnet strip, not sure yet. the spool racks were both made from thrifted wood strips. the first one, on the left, i made with a wood game board of some kind found at value village. there were already holes, which i thought would make it easier/better, but they ended up preventing the nails from going in at an angle, making spools slide right off. so that’s why i have some little mini spools on that one, just for looks really. the real one was made from a SCRAP scrap, but it only fits about half my spools, so i’ll continue searching for good wood scraps and add a second one at some point. 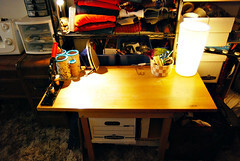 best thrift store find: the desk/sewing table at the bins for $10! amazing art-deco round edge style in fantastic condition! love love love it! 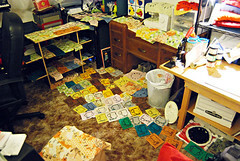 this is where i do my printing, carving, button making… anything potentially messy or able to ruin a tabletop. i have a mini ironing board that lives on here a lot of the time, too. my button-making station is over on the left side, ready to go at any moment, with all the elements living in my custom-made button-parts organizer. that light is two pieces of two different broken ikea lights put together – it works! 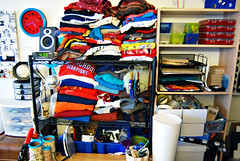 then behind the table is all my recyclable clothing – t-shirts on top, sweatshirts and sweaters in the middle, somewhat organized into “not yet cut into” and “partially used” sections. 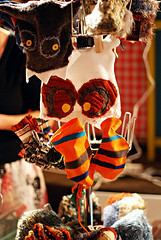 underneath the table (to the right) lives a giant bin of scraps – tshirt sleeves and other small parts. under the clothing shelves are some bins of various supplies. 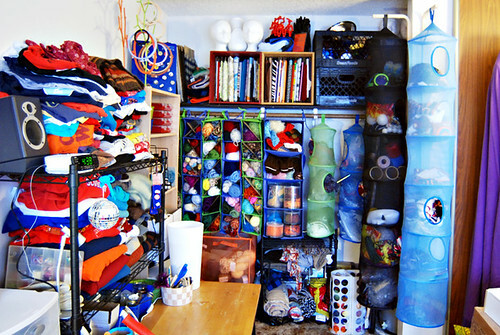 over on the tall shelf live my printing supplies, small bins of little things, random crafty tools and stuff. and on top, ikea trees grow embroidery hoops! 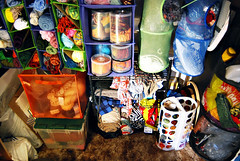 this is where all my yarn and fabric lives. and record bowls, and heads. i’m proud of my fabric organization, it took a lot of time and work! 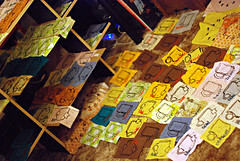 each piece is wrapped around a piece of cardboard box and filed neatly away in the boxes. so much better than the messy piles in bins system i used to have. whew that was a long tour! 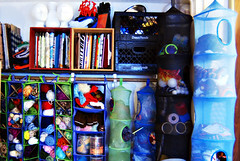 i tried to keep it somewhat minimal (but i think i failed, oh well) – if you want to see more photos, my flickr has shots of closet yarn closer-up, closet corner and again with tree detail, view of whole wall from closet, and of course you can click on any image up there to see it bigger. i just want to say that i know how lucky i am to have this studio, i really owe it to portland for being so awesome and cheap! 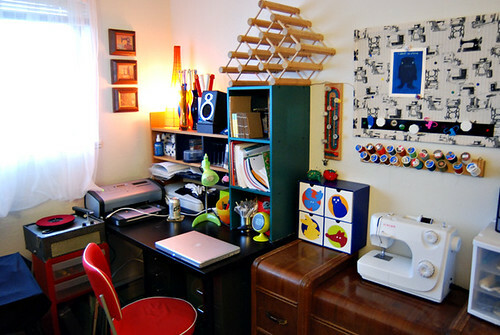 i know most crafty people out there couldn’t afford this much space in their home to devote to making things, but hopefully i’ve inspired some of you to create some kind of space if you don’t already have one, because it really does make a difference, having a specific place you can go just to be creative and productive. and of course, if crafting isn’t your thing, having a space for whatever your thing is – be it music, painting, writing, podcasting, robot-building – is a great thing and puts you in a better state of mind for creating. yay!